With over 20 years experience in the industry Pool Fix Services are your number one choice for leak location and repair on the NSW South Coast and beyond. 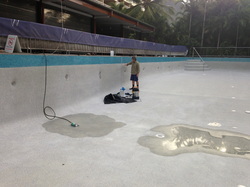 We use a range of specific equipment to detect and repair leaks in all swimming pool surfaces (tiles, concrete, pebble, vinyl liner, fibreglass, paint), as well as cracks in skimmer boxes, expansion joints, burst and leaking pool plumbing and pipework. Mick has a long history of working in and around swimming pools (including installation of all pool surfaces and shell construction) and as such has a broad knowledge base enabling him to find and fix any problem.